When I teach I often ask students to bring a piece of their own wood to use in class. It can be small enough to fit in a suitcase. It can be something they bought specifically to use in class, or it can be something they’ve saved for years. It can be something from a friend, or from family. The point here is that creativity often starts with wood. 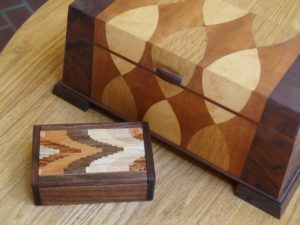 The love of wood is why one would choose to make a box from wood rather than any other material, and having each student bring something from their own shop guarantees that at some point in the course of a week-long class in box making, each student will have done work that reflects their own values, their own sense of beauty, and their own sense of relationship. The question my students often ask, however, is what size does it need to be in order to be useful in class? Of course it depends to some degree on the size of the box the student would want to make. Most of my box making starts with wood that is 1 in. (4 quarter) to 1 1/4 in. (5/4) thick. This leaves the wood thick enough to re-saw using either the band saw or table saw into box sides of a reasonable thickness. The other question my students ask, is “How much wood should I bring?” Again, that depends. Not all students will have come from a driving distance away, and whatever you bring, that you can’t use can be shared and used thereby to build relationships with new friends in the class. A third question that my students often ask is ‘What woods look good together?” That was the subject of an article I wrote for Woodcraft Magazine for their June/July issue available here. Make yourself smart and your life meaningful. Try box making.